First Building rebuilt after the Village 1870 fire. 1. Spareribs were not packed but amounted to waste and were given away. Liver and suet were given away with 25 cents worth of steak. 2. Farmers would bring wagonloads of dressed hogs and sell them to merchants who cut them up into barrels to send east. Up to 12 wagons would be lined up. 3. Woolsacks 10’ long were shipped east via Lake Erie. A man would throw in fleeces and a boy would get inside the sack and stamp them down. 1. Mr. Bissell occupied 1st floor of brick block with a bookstore and the rest of corner block was a residence in 1843. 2. Mr. Bissell moved his book store to #108 West Washington Street in 1849. 1. In the southwest room of the 2nd story was a rag bin with 1000 pounds stored there, was blamed for the 1848 Village fire, but the fire didn’t start there as the pick-up had just been made..
2. In 1849, Judge Charles Castle had a 3 story, brick and block building built by Rounds Brothers after the 1848 Village fire. 1. G. A. L. Boult was a Clerk for C. J. Warner in 1860. 1. In the 1870’s Pat Feeny stood on the Miller Block corner shouting “”fine day” no matter what the weather. 1. 1867 - Mr. J. P. Miller has just returned from New York and is daily receiving and opening a large stock of Dry goods, ready-made clothing, hats, caps, furs and crockery. 2. J. P. Miller Store 1867-1870, then bankrupt in 1871. 1. All of the grocery stock of High and Goodwin was lost in the village fire of 1870. 1. Louis Abraham rented south half of Miller Block in 1906. 2. Louis Abraham Store had smoke damage from Cannon Grocery Store fire in 1910. 3. 1st floor rented to Abrams Clothier in 1910. Louis Abrams has a red canvas sign in 1911. 1. Fruit stand on the street in front of Miller block 1915. Louis Abraham sued Louis Weisberger for public annoyance and blocking sidewalk. Store owner Mary A. Neel signs a bail bond and Weisberg finally took out a selling license in 1915. 4. Reuben J. Hyde, Medina County Treasurer with two Medina proprietors on South Court Street in 1914. 1. Store room in Miller Block remodeled, re-floored, with better lighting, re-shelved and a new plate glass front window for leasing store to Fisher and Hyde Shoes. 1. In December of 1917, Reuben J. Hyde bought the interest of Mr. Fisher and formed a partnership with Louis F. Garver, his best friend, who formerly was employed at the Medina County Gazette. The new company was named "Hyde-Garver Shoe Store" and moved to the Miller Block on the Square, located on the southwest corner of East Washington and South Court Streets. 1. Reuben J. Hyde, partner in Hyde and Garver Shoe Store in doorway of store at 201 South Court Street. 1. In February, 1921 the successful five year partnership was dissolved when Reuben J. Hyde sought to pursue other interests. L. F. Garver bought Reuben's interests and renamed the company L. F. Garver and Son (Marion) Shoe Store. This father-son shoe business in Medina would continue until August 31, 1926, when it was purchased by W. H. Newcomer of Mansfield, Ohio. 1. Mr. Newcomer, a store owner in Mansfield, Ohio moved to Medina and purchased the Garver business in 1926. 1. B&L was opened by Lose in 1931 and was located in Barnard Bldg. from 1931-1933, then moved here. 2. Mary A. and J. L. Neel sold lot 33 to W.D. Lose and R.W. Buck for a B&L 5 cents to $1 store on the ground floor in 1938. The Neel and J. P. Miller family building had been owned for the past 67 years. 3. B&L remodeled basement for more floor space 1938. 1. Web D. Lose sold B&L 5 cents to $1 store to Jim Aronica proprietor of Busy Bee Shoe Store since 1943. 2. Jim Aronica will operate both businesses in 1954. 1. We take pride in providing premium yogurts and toppings that help individuals make better choices about living a nutritious and healthy lifestyle. We understand everyone does not have the same dietary needs, taste buds or appetite, so in our stores, the customers are in control of making their own creations. Customers select from a variety of weekly rotating yogurt flavors and then top it with goodies from our election of over 75 toppings including fresh fruits, nuts, cereals, chocolates and other treats. First Building rebuilt after the 1970 fire. 1. Dr. Dunn sold his practice to Dr. G. D. Billings in 1867. 1. He then came to Medina and bought the business of Dr. G. W. Dunn, dentist, and has followed the profession since. Oct. 3, 1867. 1. 1856 Gazette Office in 3 story Castle Block brick building John Weeks, Proprietor and Gazette Editor Charles Castle in 1858. 1. Successor firm to John Speer at the Gazette Office in 1854. 1. Gazette Offices 2nd Floor in Miller Building, J. H. Greene and H. W. Clark Publishers. Established 1835, circulation 2000. 1. A new dress-making establishment is in Medina over the Miller store. Mrs. A. A. Root desires to inform the ladies of Medina and vicinity that she is prepared to do all kinds of dress-making in the latest and most approved style, and will endeavor to please all who may favor her with their patronage. 1. L. S. Murray, MD moved his residence from Brainard upstairs and lives in room behind office in 1906. 1. Freda Snyder sold her millinery business to Mrs. Stephen Hanshue and daughter, Mrs. Max Sargent. Constructed by Chamberlin and Johnson to accommodate two store fronts 18’ x 57’ in size from 1873 to 1936, with full sized fruit cellar flagged with Berea stone and designed for spring butter. Iron columns and iron balusters on Walker’s building from Cleveland City Iron Works of Hitchcock and Company. 1. If you wish a good pair of boots or shoes, call on William or H. G. Sipher, who will warrant a fit every time or no sale. 2. J. R. Stebbins closed his business at this location just 2 days prior to the fire on April 14, 1870. 1. Chavis moved into the 1st floor room vacated by National Dinning Hall. 2. Frank Chavis and wife were also artists. 3. Frank moved to Albro Block basement into a new shop with John Berry in 1875. 1. Before entering the retail business, Mr. Dannley has been engaged in the employ of the Root establishment and the B. H. Wood Company for the last 20 years in the capacity of machinist. 1. Corm Cannon left the business in 1897 to open a general store in Blake, Ohio. 1. Cannon store fire caused a loss of all stock and fittings in the amount of $2000 in 1910. 2. Son, Charles took over the grocery business of his father. 3. Cannon Grocery Store moved to 221 South Court Street when Charles Cannon bought the Sipher grocery business in 1926. 1. Gooden sold cigars and chewing tobacco and 15 cent baths in back room in 1920 to 1923. 2. Open 7:30 am – 8:00 pm, and until 11:00 pm on Saturday so that shopkeepers could come in for weekly haircut and bath after closing their stores. 3. The Shop had gas lamps and walls were lined with ads that paid the rent. Shaves were $1.50. 1. Glen Rohrbaugh and Fred Schindelholz were barbers from 1924 until they opened their own shop at 107 West Liberty Street in 1941. 2. Cards above the mirrors advertise old Medina businesses: Hyde & Bagley, Real Estate & Insurance; L. F. Garver & Son High grade Footwear, correctly fitted; Rodgers Storage Garage; Medina Motor Co.; Real Service on High Grade Coal Ohio Cash Coal Co.; Gunkelman's Clothing Store; Sprankle & Son Contractors & Builders. 1. Mr. Young was re-appointed by President Coolidge in January, 1927. Allen E. Young passed away in February, 1929 and was succeeded by Acting-Postmaster William E. Gates. 2. Post Office moved to McDowell Block just below corner of West Washington and South Court in 1927. 3. Post Office remodeled and added 12’ to original length, with modern heat and lighting. 1. The United States senate late Friday confirmed the appointment of William E. Gates to be postmaster of Medina, an appointment which had been sent in by President Warren E. Harding on the reopening of congress. 2. Mr. Gates has been serving acting postmaster since the death of Allen E. Young and much speculation had attended the delay in sending in the formal appointment, marked as it was by the visit here of Inspectors who conducted an examination of a group of candidates for appointment. 3. Francis Seiberling of Akron, congressman from the district, notified Mr. Gates by wire of the appointment and the confirmation was noted in the newspapers as of Friday September 20, 1920. 1. In 1935, Neal Roshon was appointed Postmaster of Medina Village by President Franklin Roosevelt. 2. Mr. Roshon, in addition to serving as Deputy Postmaster and Postmaster for 20 years, he also served a term as Medina County Sheriff. 3. In 1937, the Medina Village Post Office moved to a new building at 143 West Liberty Street. 1. Tom W. Goulding purchased the McDowell property including the lot and business block and an adjoining lot and frame building occupied by Gooden’s Barbershop facing West Washington Street. 1. Previous store location was at 47 South Side Public Square. 2. JK Gift Shop has a range of pieces described by McNabb as “gifts you want to give and gifts you’d love to receive”. 1. 1877-The old Gazette office proving altogether too small for the convenient transaction of our business, we have secured the large and commodious rooms south of our former office and occupied heretofore by C. B. Chamberlin, where we shall hereafter be found. We shall now have plenty of room to stretch our limbs and breathe easily, and when we get to it, hope to have them fixed up very comfortably. Our friends are invited to call in and see us in our new sanctum. 1. Addie S. Miller’s human hair goods: pompadours, switches, puff clusters and massage. Flora M. Fortson joins Addie S. Miller. We do water waving, marveling, Violet Ray, scalp treatments in our own workrooms and can match any color scalp. 1. He worked for A. I. Root; blind from 1907 and lower limbs paralyzed in 1910, died in 1917. 1. Wait organized new art club in 1925. Glenn C. Colburn Insurance Agency, (1938-1940). 1. Business moved to 79 South Broadway Street in 1952. 1. Mrs. C.W. Reinhold lives in Grafton, OH, but operates the store daily. Originally home to three stores, including a shoe shop below and six offices above. Iron columns and iron balusters on Walker’s building from Cleveland City Iron Works of Hitchcock and Company. 1. B. Prentice relocate at #213 South Court Street after the fire of 1948. 1. Where a customer will find the largest and most desirable stock of American and Italian marble. 1. Grand Closing Sale in April 1874 due to the need to vacate their store. 1. William H. Hayslip left Lord Shoe Store in 1875. 2. Grand Closing Sale in April 1874 due to the need to vacate their store. Johnson Grocery Store, T. J. Johnson, Prop. (1875-1876). 1. Mr. Munn moved from the Union Block after selling his business to G. W. Hobart and purchased the grocery business of Mr. Johnson in 1876. 1. M. T. Wright moved his book and stationary business to #221 South Court Street in 1923, when W. G. Steele purchased Wright’s printing office and equipment and moved it to Pennsylvania. 1. 2nd floor in former YMCA rooms in 1945. 2. Nut shops, lunch room, dining room open 7 am to midnight in 1945. 1. Louis Gilbert purchased George Lenaburg’s half-interest in Gilbert’s Market in 1955. 1. Sportsworld Custom Imprinted Apparel was established in 1997. We have many years of experience in the screen printing and embroidery industry. 2. Sports World moved here from #108 West Washington Street in 2009. 1. The INSYTE Technology managed IT support services can help with the time-consuming process of monitoring and managing networks and business computer systems, including managed anti-virus services and saving daily backups. 1. Shepard moved his business to the Union building at 23 Public Square in 1886. 2. Mrs. Wilmott maintained a Millinery Store above O. C. Shepard Store in 1878. 1. McDougall’s purchased all the grocery stock of Isaac and George F. High when I. R. retired and George went into the jewelry business in 1885. 1. W. E. Sargent sold block to Ephriam Brenner for $2,900 and he will remodel store with a plate glass front and will remove the stairway to rear. Store will be occupied by George F. High for jewelry and John W. Tuttle for drugs on other side in 1900. 2. John Tuttle was formerly employed by McDowell Drug Store for several years. 3. W. J. Orr was pharmacist for Tuttle and High in 1901. 4. George F. High Jewelry moved to 1 door South of Brenner Harness Shop in1900 from #52 South Public Square and will share a store front with Tuttle Drug Store. 1. In 1902, George High and Blake Hendrickson, both avid cyclists, partnered to open the Bicycle Headquarters in the village and sold all makes and models out of the High’s jewelry store location. 1. George F. High moved his jewelry business to #13 West Public Square formerly occupied by H. H. Brainard Jewelry. 2. J. W. Tuttle will now have space for his dry cleaning business and will place the soda fountain and soft drink tables on the south side of the store on April 2 1909. 1. Rexall Drug Store sold by John Tuttle estate to Ray Snyder in 1922. 1. A furniture store that sells repurposed architectural and industrial furnishings. 1. Mr. Saliba, a resident of North Olmsted, Ohio, formerly owned JCS Multi Media Company in Lakewood, Ohio from 1995 to 2007, then worked at SpaceBound in LaGrange, Ohio from 2009 – 2017. 2. From 1992 - 2007, Riz Saliba was self-employed as a Trade Show Exhibitor at computer shows throughout United States. 3. RizTech carries a huge selection of different models and brands of new and refurbished Mac and PC Laptops, Desktops, Monitors, Android Tablets, iPads and a huge assortment of tech accessories. 4. RizTech offer services on both Mac and PC brands such as Virus and Spyware Removal, Screen Replacement on Laptops and Tablets, Laptop and Desktop Repairs and Upgrades. The original store front still exists. This is the site of a family-owned Grocery and crockery store for almost one hundred years. 1. Mr. R. Nelson would announce to the citizens of Medina that he has recently opened a gunsmith shop a few doors south of the Gazette Building. 1. Bradway business was wiped out in the Village fire of 1870. He slept through the fire and only noticed it as he went to work. While the city was still smoldering they set up a grocery and hardware business in the little frame building where the Asire block is now in1915. In 1873 they built the brick building now occupied by W.H. Sipher. 2. Before the fire Isaac High was in hardware business with Bradway. 1. Edward Munn moved to Kansas in 1880 and sold his business back to W. H. Sipher. 1. George R. Whipple acquired an interest in Sipher’s grocery business in 1883. 2. Whipple and Sipher have placed a fine refrigerator in their grocery and now serve customers with butter, watermelons and other fragile articles fresh from ice in August, 1887. 3. Delivery wagon stopped in front of Oatman Hardware and Wipple and Sipher Grocery Store on South Court Street. 1. Whipple and Sipher sold their grocery store to Warner and McNeal in 1901. 1. John Whipple and William H, Sipher bought the grocery business from Warner and McNeal in 1906. 1. William H. Sipher bought out the partnership with John Whipple in 1913. 1. William H. Sipher sold his grocery and provisions store to C. W. Carlton and H. S. Koppes in 1920. 1. W. H. Sipher sold his grocery store to F. C. Fish Cash and Carry in 1922 and remained in the business as a clerk. 1. M. T. Wright moved his book and stationary business from #213 South Court Street in 1923, when W. G. Steele purchased Wright’s printing office and equipment and moved it to Pennsylvania. 1. F. C. Fisk sold his interests in grocery partnership to W. H. Sipher in 1926. 1. W. H. Sipher sold his grocery store to C. M. Cannon in the same year he dissolved the partnership with F. C. Fisk. 1. 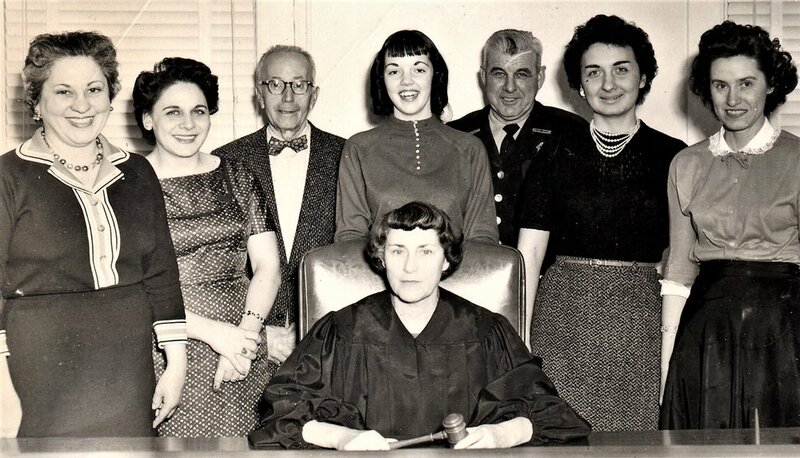 Daughter, Ida Cannon took over proprietorship after the death of her father in 1942. 2. Miss Cannon was a great clerk who cared about each customer. She tied all the bags and parcels with ribbon, to add a personal touch. She stood behind the counter to get everything the customer needed. She had delivered groceries too. The boys she hired called her old station wagon the "Cannon-ball". She was a wonderful woman who ran a store all by herself. 1. One of the most attractive stores with fancy gifts for sale on South Court Street. 1. Pat Boyle sold her Gramercy Gallery to Pam Miller in 1989. 2. As The Boyle Family passed over the shop to Pam Miller, she preserved the gallery’s unique authenticity. She not only sold knick-knacks, but also featured pieces from local artists. 1. Original surfaces from when the building once housed Cannon's grocery store are set against an array of antiques and prints, which Harris' uncle has acquired over the years as an antique dealer. 2. The space has a decidedly relaxed feel to it and offers a dozen different wines by the glass—as well as craft beer, mead, liqueurs and other non-alcoholic drinks, coffees and sodas. 3. Light bites are available via a locally-sourced tapas menu, which features local breads, cheeses, olives and other consumables from vendors like Canal Junction Farmstead Cheese (Defiance), Makenzie Creamery (Hiram), Crooked River Herb Farm (Wadsworth) and Cleveland's Lake Erie Creamery. 4. For a corkage fee, patrons can purchase a bottle of wine from a robust slate of 250 labels—from both Old World and New World regions—and can enjoy it in the cozy Huth & Harris storefront. 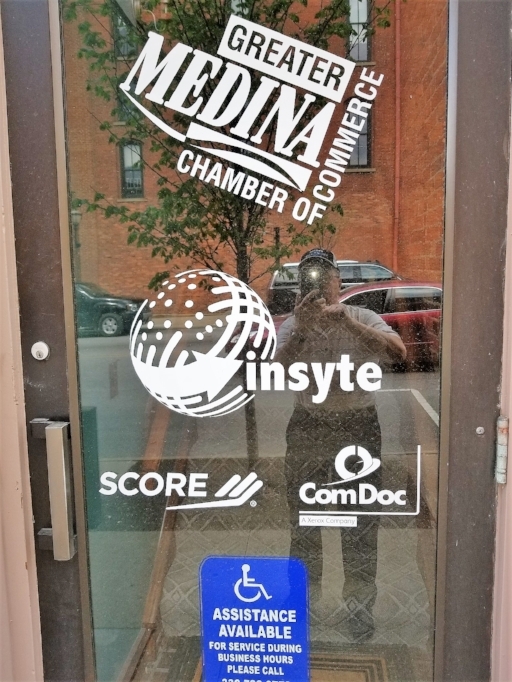 The building located at 225 South Court Street has been in operation since 1872 and supplying Medina with hardware since 1872. This building was first built after the fire in 1870 on the square. Its first owner was Lyman Oatman, who named the building Oatman's Hardware. He owned the store until 1933. In 1933, he sold the store to Willard Stephenson who changed the name to Medina Hardware. Today Medina Hardware is owned by Willard's son Rick Stephenson and attempts to retain as much tradition as possible in today's modern society. 1. The Oatman Brothers built a two story, brick building to house their hardware store after the village fire in 1870. 2. Oatman Brothers are making a decided specialty of bicycles, a separate department being devoted to this branch of the business. A. W. Oatman son of Orlin Oatman has exclusive charge of this department. 1. They are also patentees and owners of Burdoin’s celebrated eave-trough hangers, of which they manufacturer in large quantities and ship them to all parts of the Union. 1. Medina County Gazette August 31, 1888--The other day O. and L. Oatman sold a farmer a dish pan and half a dozen steel knives. He put the pan in his wagon and the knives in the pan. They were in a thick paper box, of the sliding kind, wrapped in two or three thicknesses of paper. In less than twenty minutes parties saw smoke coming from his wagon and on investigating found that the box containing the steel knives in the dish pan was on fire and had burned a hole through the box and the paper in which the knives were wrapped. The bright tin dish pan had drawn the sun's rays to a focus on the paper and ignited it. Whether the steel had anything to do with it is a question worth trying to solve. Undoubtedly many fires are caused by such means which are unaccountable. 2. In 1908, Orlin and Lyman Oatman have just put into their store a new elevator which for convenience in their business is not surpassed. 3. Orlin Oatman is retiring from the business and Lyman has purchased his interests in the hardware business in 1908. 1. Lyman Oatman Jr. passed away in February, 1913 and his wife took over as proprietor of the hardware store. 1. Willard Stephenson purchased the hardware business from the Oatman family estate in 1933, for $10.000 after graduating from Miami of Ohio College the year before in 1932. Later Stephenson would purchase the building for $20,000.The combined purchases in today’s dollars would be equal to nearly $600,000. 2. W. A. Stephenson changed the name of Oatman’s to Medina Hardware being that the store should stand on its own merits. Also, new lines are carried such as electrical goods, plumbing fixtures, etc. The 1919 cash register, with four drawers and a myriad of buttons, some with the numbers worn off, that Steve bought to replace the original one, because the old one only went up to $9.99, is still present in the store today which has lasted over seventy years of use. The register embodies the ideas of tradition and old-fashion business which Willard Stephenson promoted when he first bought Medina Hardware from the Oatman brothers. 3. Barbour Berry and Charles Ritter Sheet Metal and Roofing work out of Medina Hardware from 1933-1936, then moved their business to #233 South Court Street where they remained for 58 years. 4. In 1940, Willard Stephenson caught 2 men stealing a power lawn mower from in front of his store and chased them 15 miles until their car wrecked in Litchfield. 5. In 1942, Willard Stephenson is commodore of the Chippewa Lake Yacht Club. The Club is only 2 years old and has 99 members They will build a club house near the Townsend estate, with a fireplace, large screened porch and kitchenette. 1. Aug. 25 1942, Willard A Stephenson was suddenly called to military service and appointed 2nd lieutenant in engineer’s amphibian command of the Army Corps of Engineers, due to his knowledge of small water craft. 2. His brother Harold H. Stephenson will move to Chippewa Lake from Zanesville to operate Medina Hardware in his absence. 1. Upon discharge from military service, Steve resumed his active daily management of the hardware business for the next 59 years. 2. In addition to hardware, Steve sold software, of a sort, at his store. He raised buffalos on his Bar S Farm in Lafayette Township from 1968 to 1995, selling meat and hides. 3. Steve’s son, Richard “Rick” Stephenson started helping out in the store in 1970 and officially became an employee five years later. 1. “Steve” was active in the business until early in his 99th year of life, passing on in November 25, 2008. 2. A well-kept secret is the outstanding kitchen store in the basement where you can find every imaginable cooking gadget. 1. Rick served as Maytag Machine Repair Specialist in addition to clerking in the store for many years prior to becoming owner in 2008. 2. Rick Stephenson, Willard's son, still uses the same cash register that his father bought in 1935. 3. Although the country is going through technological proliferation the only modem technology Medina Hardware has is a computer He believes that, to run a good business, the manager must keep the business small, take nobody for granted, and always put service first. 4. This is a beloved Medina institution — an old fashioned hardware store where you can ask for five small nails if that’s all you need and someone will climb a ladder to get them for you from the old oak drawers that line the walls.